Jenny’s cookbook is out! 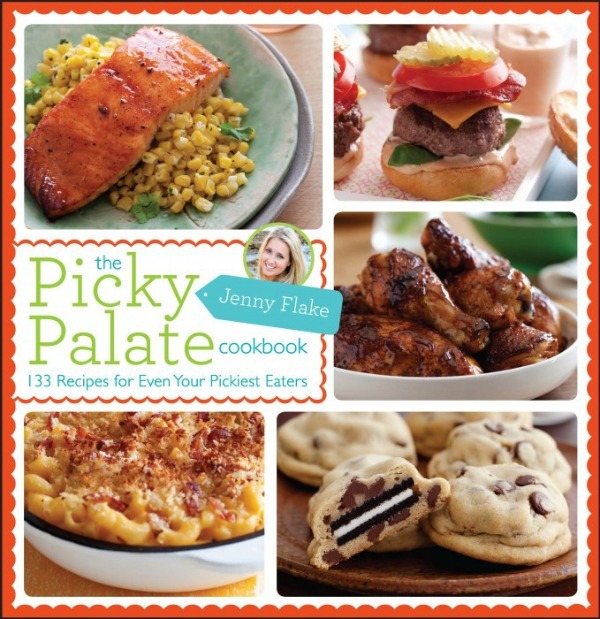 The Picky Palate Cookbook was published on October 23, 2012. Picky Palate must be SO excited. This week I am going to be giving away The Picky Palate Cookbook to one lucky person. More details of this giveaway are at the bottom of the post. Now let’s get started so that I can tell you guys what I made. This week I made the Skillet Macaroni and Cheese from The Picky Palate Cookbook. I liked it as soon as I saw the recipe. Can you guess why? It’s kind of obvious. It has BACON in it! Now do you understand why I stuck a finger in the pan? Yum Yum Yum!!! Bacon is great on everything in the entire universe, but it is awesome on this mac. I’m a goofball. In case you haven’t noticed (which is almost impossible), I like to make funny poses. I’m ready for my football game in this picture. The macaroni and cheese was great. The bacon made it 2x as good. 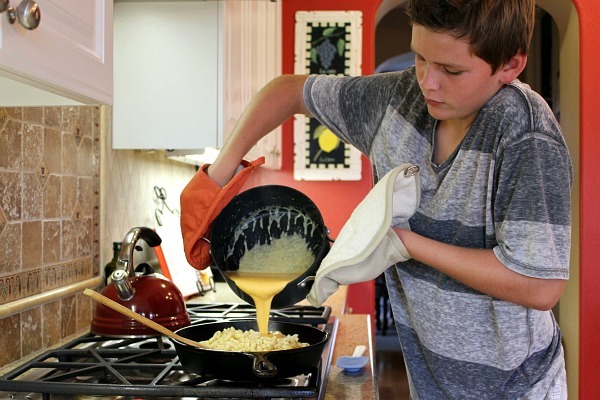 Jenny created a great recipe when she thought up this Skillet Macaroni and Cheese. Jenny’s cookbook is really good. The inside looks a little like my mom’s cookbook that is coming out soon. Picky Palate made her cookbook a winner by putting tons of good recipes into it. I’ve tried the Oreo Stuffed Chocolate Chip Cookies too, and I LOVED them. The mac and cheese and the cookies are just a few samples of the great recipes the cookbook has. 1. Leave a comment here telling me what you like on your macaroni and cheese. 2. Share the giveaway on your facebook page or on Pinterest. Then come back and leave a comment telling me you shared. Giveaway ends Sunday, Nov. 18th at 6PM PST. US Residents only. Winners will be chosen via Random.org and be notified by email. Winner will have 48 hours to respond to my email. Giveaway is now closed! The randomly selected winner is commenter #64: Brandie. Congrats! 1. Preheat the oven to 350 degrees F. Spray a 9-inch cast-iron skillet with nonstick spray. 2. Cook the pasta according to package directions, drain, then rinse under cool water to stop the cooking. 3. Melt 3 tablespoons butter in a small saucepan over medium heat. Add the flour, salt, paprika, and pepper and whisk to combine. Slowly add the milk, whisking until smooth and thickened, about 5 minutes. Add the cheddar cheese and stir until smooth. 4. Transfer the cooked pasta to the skillet. Pour in the cheese sauce, stirring to combine. 5. In a microwave-safe bowl, melt the remaining 5 tablespoons butter in the microwave. Add the bread crumbs, bacon and Parmesan and stir to combine. Sprinkle over the mac and cheese, and bake for 25 to 30 minutes, until hot and bubbly. Disclosure: The book for this giveaway is being provided by Wiley & Sons. I was given a copy of The Picky Palate Cookbook for review, and all opinions shared are my own. Amazon affiliate links are included within this post. I usually prefer my macaroni and cheese pretty bare. But I am all for trying new versions! I usually just put breadcrumbs on top – never thought of bacon before! The crunch would be a good contrast. I am a traditionalist – no add ins in my mac n cheese! I recently made a Pumpkin Mac & Cheese & it was so yummy! I also pinned this giveaway on pinterest! I love mac n’ cheese. As someone who tries to make everything healthy….I’m a fan of hiding veggies in there. I can puree carrots and add it to the cheese sauce! Also…I had a mac n cheese the other day that had curried veggies in it. It was to die for GOOD!!! I like mac and cheese with blue cheese crumbles and bacon. Oh wow, this recipe looks delicious! I can’t wait to try it! I like cheddar cheese and ham pieces in my mac & cheese recipe! Recipe Boy!! Thank you for highlighting my mac and cheese and cookbook!! You made it perfectly! Great job and have a great day!! I love my macaroni and cheese with toasted bread crumbs on top!! Don’t usually add anything on my Macaroni and Cheese. Just like it plain and simple the way it is. I actually have never tried it any other way. I bet that I would love the breadcrumbs! I’m not a huge fan of maccaroni and cheese myself, but my husband is. His favorite version is made with bacon and scallops. My favorite recipe has ham in it! This looks good, too! I’d love to enter for the giveaway! I love almost anything added on my macaroni and cheese, my favorite though is Extra Cheese and Oyster Crackers. I love lots of cheese and lots of breadcrumbs on top! Usually I just have my mac and cheese sans toppings to not get in the way of the cheesey goodness. However, I wouldn’t be opposed to trying it out topped with bacon! 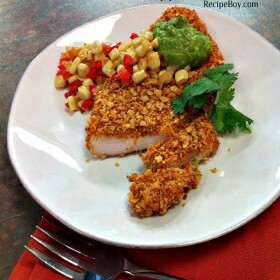 Toasted breadcrumbs on top is delish! Love this mac and cheese! I recently had a great mac and cheese with artichoke hearts and goat cheese stirred in and breadcrumbs on top! This looks great. I love sliced tomatoes, cracked black pepper and bread crumbs on top of my mac and cheese. I usually add Panko to give it a little crunch, but bacon sounds awesome!!!!!! Great photos!!! I love hot dogs in it and crushed ritz crackers on top! I love bacon with extra cheese on top! I love black pepper or peas with my Mac & Cheese! I love my mac & cheese with bacon, panko bread crumbs and lots & lots of cheese!! Looks great, yummy, I love to add broccli tops, and yes sometime some feta cheese. I like cheese.. and cheese.. OH! and more Cheese! Did I mention I like cheese with my macaroni? I don’t usually eat my mac and cheese topped with anything but I would be willing to try it with bacon 🙂 Bacon does make everything better. I’ve never put a topping on mac and cheese but I like the idea of bacon. I love Mac & cheese with stewed tomatoes or breadcrumbs on top! Mac & cheese is a dish which I’ve enjoyed in my lifetime! I like my mac and cheese without any topping, but your recipe does look yummy! I like a breadcrumb topping the best. Some parm cheesemixed in makes it extra yummy. I like to add bacon also some Asiago cheese and then I add cornflake crumbs to the top. Thanks for the chance to win a copy of your cookbook. It is my comfort food after a hard day of work! I love to put mushrooms in my mac and cheese, but my boy likes his plain. I bet he would TOTALLY appreciate the bacon though!! So happy to have found your blog, your adorkable! I love Mac and Cheese with toasted breadcrumbs on top. Also had Lobster Mac and Cheese at a restaurant and it was amazing! I recently added jalapeno and bacon to my mac & cheese recipe for a Southwestern kick! It turned out great. Lobster Mac and Cheese is always a favorite! I also saw a recipe for mac and cheese with brussel sprouts and bacon in it on the Food Network that looked great too! That crunchy bread topping is awesome! But once the mac and cheese is on my plate I love to top it with some homemade salsa. So good!! 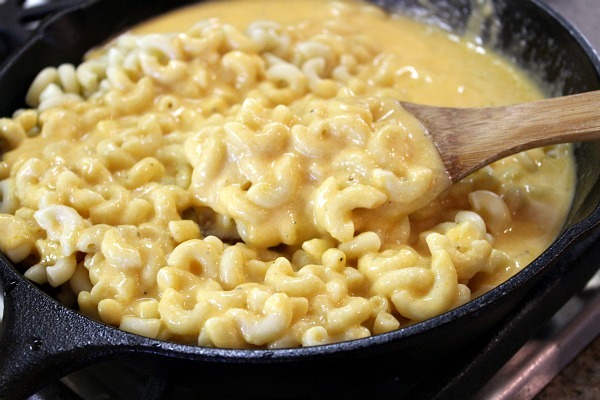 Mac and cheese is one of the best foods out there! I like bacon and ritz crackers on my macaroni and cheese! This Mac & cheese sounds delish! I can’t wait to try it. I guess I’m pretty plain because I’ve never added any toppings to my Mac & cheese. I love Mac N Cheese, its my favorite dish. I love it with a lot of extra cheese on top, especially sharp cheddar. My favorite way to top mac and cheese is with bread crumbs. I also love a side of freshly sliced tomatoes! I have an 11 year old very picky eater, so this new cookbook looks wonderful! 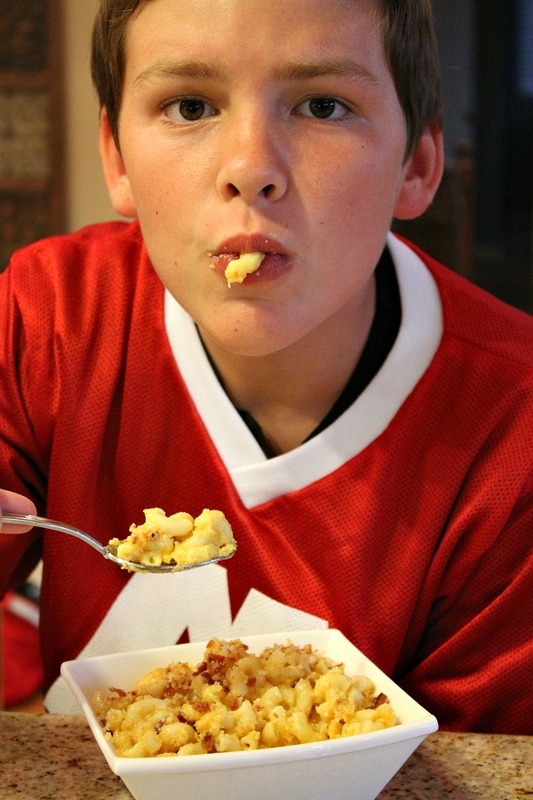 Thanks for sharing your macaroni and cheese experience. My son and I both love that you have a recipe blog! 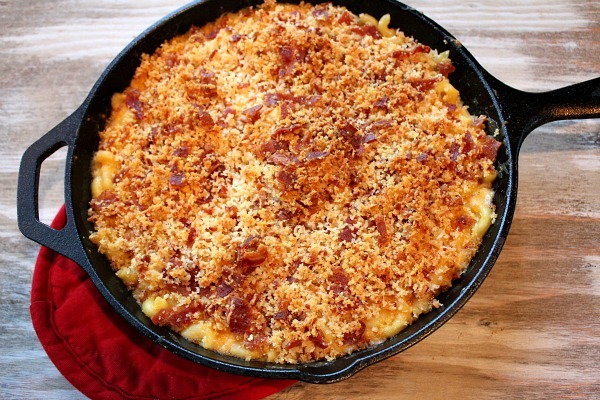 I put buttered bread crumbs along with a little crumbled bacon…..yum!! This mac & cheese looks great just as it is! But a couple of my favorites to add to this classic include, bacon, broccoli, chicken & even avocado. Bacon! Bacon makes everything better. My family is going to LOVE this!! And I can’t wait to check out Jenny’s new book! Believe it or not… I love STEAK on my mac n’ cheese. It is delicious! Good job! That looks really good! 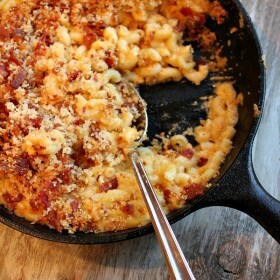 Mostly I like Bacon & Bread Crumbs on my Mac & Cheese But Just about anything would taste good with mac & cheese!! I pinned this to pinterest also because I Will Be Making This!! Thanks!! What i like on my Mac-n-Cheese is onions, tomatoes and bacon. Yum YUM!!! I love broccoli in my mac and cheese! It’s always different b/c the possibilities are endless! I love adding pimentos to my mac and cheese to give it a tangy flavor. I first had pimento mac & cheese at a restaurant and went home and tried my best to replicate, but haven’t gotten it quite right. Any mac & cheese is delicious though! I love crumbled bacon and jalapeño pepper bits on my mac n cheese! I’m hungry for some right now! OMG! I think bacon may be my new favorite topping for Mac and cheese! Great job, Recipe Boy! If I haven’t already added chopped jalapenos or some other type of chili pepper, then there had better be some hot sauce or Tabasco close by! I always put crumbled bacon on my Mac n cheese!! Love my Mac n Cheese seasoned with salt and pepper! I also LOVE adding bacon! I love my mac and cheese extra cheesy with sour cream added, and sometimes beef, bacon, or green onions. I love mine with panko on top for a little crunch. This looks DELICIOUS! I just made some mac and cheese last week and it is so good! I like chicken, bacon and some veggies in mine. This skillet one looks amazing though! 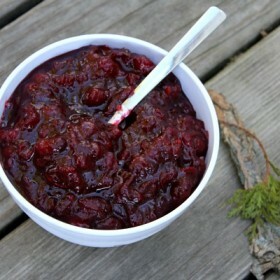 I’m kind of a purist although this recipe might go on the menu in the next month. I know my son will love it. Shared on Facebook. Great giveaway! I love ketchup on my mac! 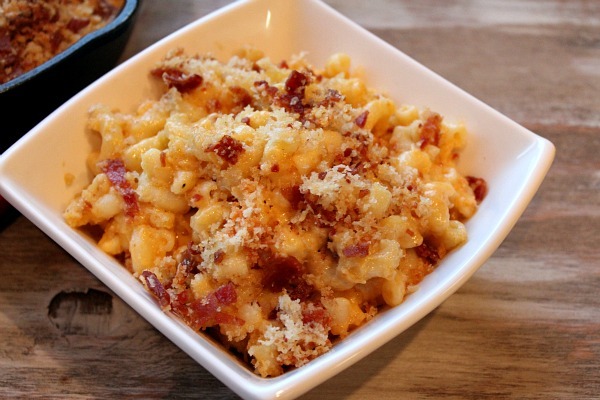 Mac and Cheese with bacon. I like to mix 3 cheeses together. Trader Joes Extra Extra Sharp Chedder, Parmigiano-Reggiano and mozzarella. I liked this on facebook. I pinned it and tweeted it. That recipe sure looks good! The last few times I started adding it bacon! i love it! thanks so much for the chance to win! Iam sharing this giveaway on facebook! Recently I had been adding bacon to my mac n cheese! yours look delicious!! Carmalized onions, sun dried tomatoes, goat cheese, fontina and a little smoked gouda! Amazin!!! We are loving Jenny’s book too! We will have to try the mac and cheese next. It looks so good! I absolutely LOVE green chile in my mac-n-cheese! Best comfort food ever! Frosted flakes! Sounds crazy but crushed, buttered Frosted Flakes sprinkled over mac & cheese, then broiled gives it a nice crust with a sweet undertone. Delicious! I have tried adding ground turkey beef with taco seasoning and rotel sauce for a side dish with tacos or enchiladas. Love it! Pinned the contest link! Yaaaaay! I love putting crushed up Cheese crackers on top. So young and talent!! I love my mac-n-cheese with breads crumbs! lots of them! 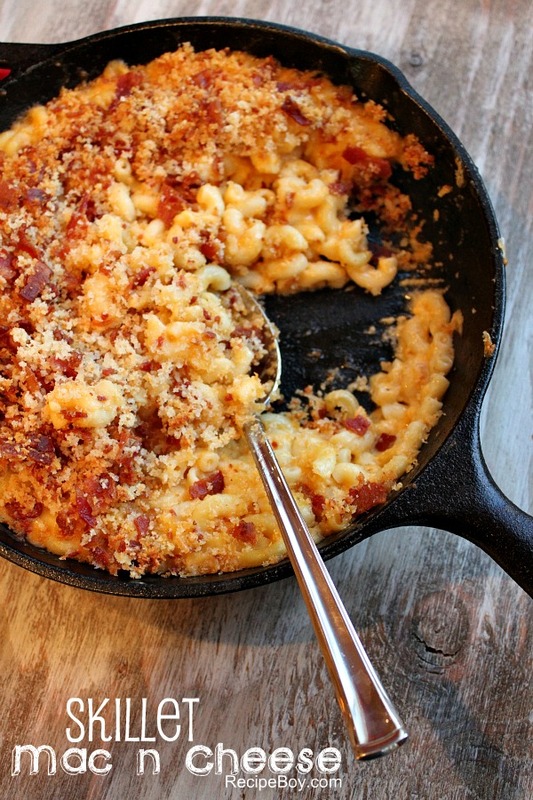 I like almost anything in mac & cheese…but bacon might be my new favorite!! I pinned about this giveaway! This was delicious!! Any ideas what’s the best way to reheat this? I have tons of leftover that I would love to take as lunch to work. A microwave or oven would work fine. Good job young sir. It’s the best recipe for mac n cheese out there! Macaroni and cheese has been my favorite dish since I can remember. Who doesn’t love LOVE bacon! Combine the two and I’m in Heaven!